Get Out. Get Fit. Do it Now. Fitness doesn't have to be kept indoors and constrained within mirrored walls and poor lighting. New pieces of outdoor exercise equipment are being designed all the time—the real question is, what should you look for and how can you implement it into your facility? There are many benefits to placing outdoor fitness equipment in your office complex, sports field or any other facility you see fit. Whether it's improving employee moral, creating a more efficient sports area or a long-term benefit of lowering the cost of insurance policies, both your company and those who use the fitness equipment will benefit from the outdoor area. There are five main categories that outdoor fitness equipment can generally be divided into. Each different fitness machine allows for various exercises that will help improve and strengthen the targeted muscle group. Machines like the Lat Pull Down, Chest Press, and Butterfly Machine strengthen the shoulders, chest, and upper abdominals. Regularly using these machines can also help broaden shoulders and tighten core muscles to improve posture. Other common upper body fitness equipment include Pull-up Pole Stations, Horizontal Bars, Pull-up and Dip Stations, and Rowing Machines. By using all the different equipment to perform various exercises, you can work different muscle groups to increase muscle confusion, which has been linked to more efficient workouts. Machines like the Leg Extension, Leg Press, and Lying Leg Curl strengthen the large muscle groups in the lower body such as quadriceps, hamstrings, and gluteals. Regularly using these machines can also help strengthen and tone leg muscles while enhancing knee and joint stability and functionality. 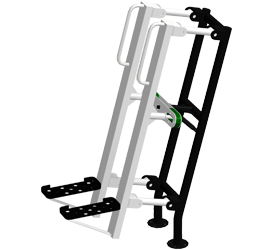 Other common lower body fitness equipment includes the Stair Climber and Triple Jump Bars. Jump Bars can be used to enhance leg exercises like lunges, squats, and plyometrics to make them more difficult or to isolate one leg or muscle. While you may wonder why anyone would use a cardiovascular machine in the outdoors, you should consider the strain that running and walking on pavement can cause to the knees, hips, and joints. Low impact equipment like Air Walkers and Cross Country Skiers simulate the running motion in a smooth motion to help reduce and even eliminate this stress. Other pieces of equipment that can be used for cardiovascular training are the Upright Stationary Bike, Jump Bars, and the Stair Climber. All of this different equipment can be used to improve cardiovascular endurance which can help reduce the risk of obesity-related diseases, lower cholesterol, and boost energy. Strength and flexibility machines like the Multi-Bars and Tai-Chi Spinners are important for stretching, which can help reduce muscle soreness and increase workout recovery. Regular stretching can help increase range of motion and prevent future injuries of joints and limbs. Hanging from bars like the Horizontal Ladder or Pull-Up Pole Stations can also help relieve tension in the shoulders and neck, and improve blood circulation throughout the entire body. Stretching is often taken for granted so it's important to include these machines at your facility. 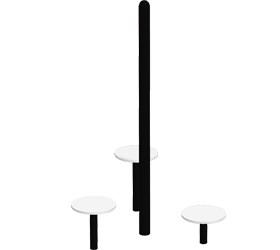 Often times equipment is available in a configuration that combines two or more of the machines you may be looking for. The standard Lat Pull Down and Vertical Press comes together. Also, cardio machines often come in one, two or three person models so the user can enjoy the workout with the company of a friend. 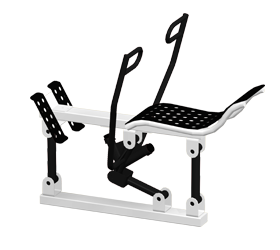 Other pieces of fitness equipment that may be combined are the Sit-Up Benches, Leg Press Machines, and many others. Each vendor is different, so if you have specific requests be sure to voice them! There are many safety precautions, instructions, and rules that should be enforced if you choose to implement an outdoor fitness area. Posting these messages on Message Boards is a good way to ensure the rules are seen and abided by. Most pieces of exercise equipment are made with powder-coated steel, usually available in a wide range of colors that can be mixed and matched for a custom multi-color finish to match the facility the equipment is being placed in. Top of the line exercise equipment will be finished with a e-coat primer and super durable polyester top coat to eliminate rust, corrosion or chipping from occurring. Environmentally conscious buyers should look for a finish that contains no PVC and does not utilize lead in the manufacturing process. Also, most pieces of outdoor exercise equipment are usually bolted to the ground but also have an in-ground component for added stability. 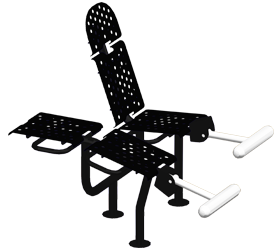 A level surface is required for proper installation of outdoor fitness equipment. Concrete footings must be poured to stabilize the in-ground mount components of the equipment. Please note: You should completely assemble the unit prior to pouring the concrete footings. A new trend in park management is to place them along running trails. People running along the path can stop and get a muscular workout in addition to working on their cardio. "Outdoor fitness equipment is on the edge of becoming the hottest trend in the park and recreation industry." Office complexes are another great place to implement outdoor fitness equipment. Being tied to a desk all day can often create complacency and fatigue in employees. Having an outlet right outside the building will allow people to escape from the daily office pressures and release stress, produce endorphins, and come back into the office feeling refreshed and motivated. Healthier employees mean higher productivity levels, improved morale around the office, and may lower insurance rates in the long-term. 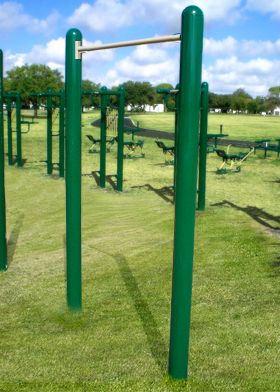 Sports fields are another convenient place to implement outdoor fitness equipment. 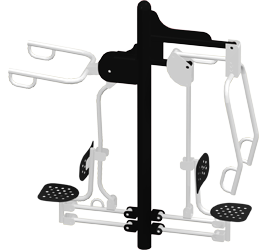 Football, baseball, track, and soccer fields are great areas to place Pull-Up Bars, Jump Bars, Stationary Bikes or whatever else you see fit. Junior High to professional level practice fields could find good use to having this equipment so close to the field. It can be used for extra low impact conditioning during practices, for easing back into the groove of things after an injury or for rehabilitation and strengthening purposes. Tourist attraction spots like beaches, hotels, and resorts are another great place to implement outdoor fitness equipment. Creating a place where visitors can workout while still being surrounded by the beautiful beach or ocean-front and not bare gym walls will be greatly appreciated by all. 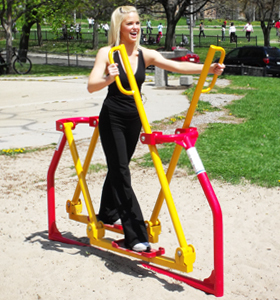 There are many different layouts of the outdoor exercise equipment that will best suit various environments. When choosing your layout, you'll want to consider the order of exercises users might partake in. Putting the Leg Extension and Leg Curl near each other might be a good idea. Same with the Butterfly and Reverse Butterfly Machines and other machines that work similar muscle groups with different variations. Click here for some suggestions on how to layout your outdoor exercise equipment area.